Since its discovery in 1930, Pluto’s mass has been a value that has repeatedly been calculated. Additionally, the search for Planet X prior to Pluto’s discovery results in mass calculations that date back several decades earlier. Over its observed history, the mass of Pluto has consistently decreased. We reassess earlier predictions of Pluto’s fate, and rule out the hypothesis that Pluto’s mass has been constant over the last century. We are able to fit linear and quadratic equations to Pluto’s mass as a function of both time and distance. The moons Nix and Hydra are visible in a series of images taken by the New Horizons spacecraft. 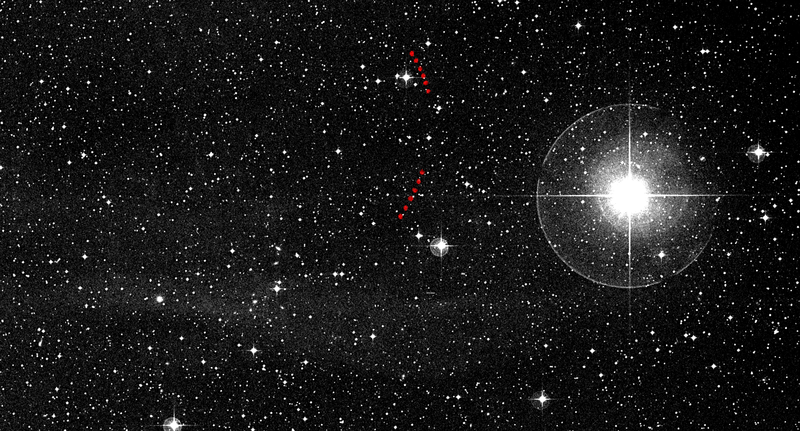 The right-hand images have been processed to remove most of Pluto and Charon’s glare, and most of the background stars. The processing leaves blotchy and streaky artifacts in the images, and also leaves a few other residual bright spots that are not real features, but makes Nix and Hydra much easier to see. Celestial north is inclined 28 degrees clockwise from the “up” direction in these images. Nix and Hydra were discovered by New Horizons team members in Hubble Space Telescope images taken in 2005. Hydra, Pluto’s outermost known moon, orbits Pluto every 38 days at a distance of approximately 40,200 miles (64,700 km), while Nix orbits every 25 days at a distance of 30,260 miles (48,700 km). Each moon is probably between 25-95 miles (approximately 40- 150 kilometers) in diameter, but scientists won’t know their sizes more precisely until New Horizons obtains close-up pictures of both of them in July. Pluto’s two other small moons, Styx and Kerberos, are still smaller and too faint to be seen by New Horizons at its current range to Pluto; they will become visible in the months to come. In just over a year, the New Horizons spacecraft will fly past Pluto, giving us our first detailed look at the dwarf planet. Anticipating this encounter, St Andrews undergraduate student Ailsa Whitelaw and her supervisor Dr Jane Greaves have used forgotten data to map the sub-surface of Pluto, peering beneath its icy coating to uncover hidden chemicals that give a hint of the future of this distant world. Dr Greaves will present the new work in her talk on Wednesday 25 June at the National Astronomy Meeting (NAM 2014) in Portsmouth. Ailsa and Jane adopted a new approach, using data obtained from the James Clerk Maxwell Telescope (JCMT) on Hawaii in the late-1990s. JCMT’s ‘SCUBA’ cameras operate in the sub-millimetre range of the spectrum, between far-infrared and microwave. Pluto was observed at 0.85 mm wavelength, meaning the waves are about 1000 times as long as our eyes can see and in a completely different region of the spectrum to any other data ever obtained from this distant world. The two scientists assembled a ‘light curve’, where brightness is plotted against time. As Pluto is rotating, the data points correspond to different longitudes on its surface. The 0.85 mm waves are emitted from beneath the surface of the dwarf planet as seen in visible light, hinting at a different chemical mix in the sub-soil. One possible explanation is that a relatively dry layer of frozen nitrogen and methane lies below a dark surface patch of water ice and frozen polymers. Because Pluto’s surface slowly boils away in sunlight (eventually removing the dark patch), this also gives us a sneak preview of its appearance thousands of years in the future. As well as their forensic analysis of Pluto’s past and future, the new results show a hemisphere of the dwarf planet that New Horizons will miss seeing in detail. 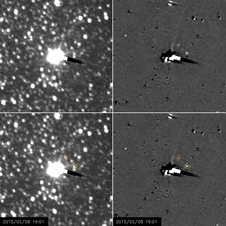 The spacecraft zooms through the Pluto system on 14 July 2015, but only has a few minutes to study one side of the dwarf planet and its largest moon Charon at close range. An online petition backed by scientists with NASA’s New Horizons mission is pushing for new postage stamp for Pluto and is hoping to hit 100,000 signatures by March 13, which is the 82nd anniversary of Pluto’s discovery. So far, the effort has gained the support of almost 6,000 Pluto fans since the petition launched on Feb. 1. 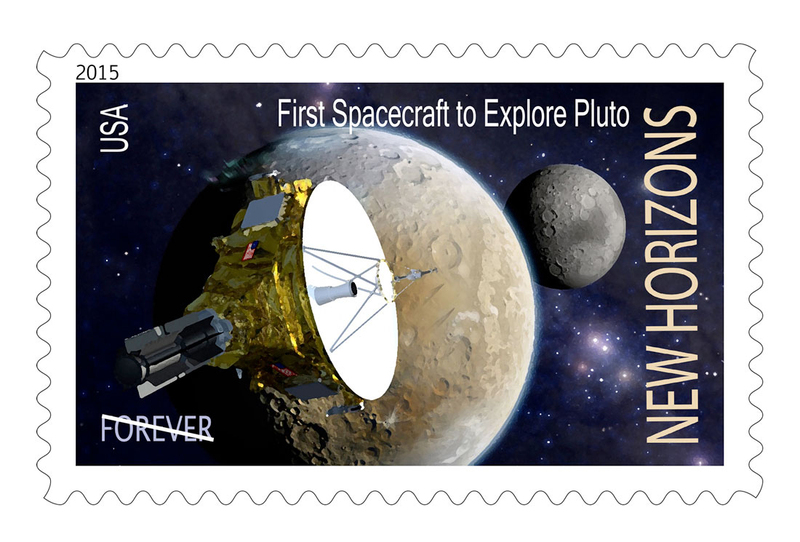 SPACE.com is tracking the new Pluto stamp effort through its March 13 deadline. The petition, hosted at Change.org, will be submitted to the Citizens’ Stamp Advisory Committee of the U.S. Postal Service.